In our article on the best higher-end audio interfaces, we made some changes to the information in our article as well as a few tweaks to the list of recommendations. We replaced one MOTU model with another, removing the 896Mk3 Hybrid and instead adding the super-cool UltraLite AVB. In today’s article we are looking at the best audio interfaces that you can find for under $1,000. While higher-priced units certainly do exist, one thousand bucks is about as high as most people want to go – especially when you consider the other things you need to invest in to make a decent studio these days (i.e. studio monitors, MIDI controllers, headphones, microphones and the rest!). What to Expect From a $1,000 Audio Interface? To make things easier, we have selected a handful of different units that fit this price range and have taken more in-depth looks at them in their full reviews. Browse the chart below, then stick around for a guide on what to look out for when shopping in this range. Lots of features, I/O options combined with rock solid hardware solutions. Brilliant fusion of great hardware, equally good software and very practical design. One of the most versatile rack mount models you will currently find. Simple, minimalist interface that is full of practical solutions and impressive performance. With the Studio-Capture, Roland cram a lot of features into a hefty little audio interface that conveniently works as both a desktop or a rackmount unit. It’s not the prettiest device out there, but Roland deliver a rock-solid aluminum chassis which is swimming in features. For example, there is a total of 16 analog inputs (12 XLR/TRS combos and four 1/4” line ports) and 10 outputs, with ample controls. Other features, such as Roland’s handy AUTO-SENS technology, in addition to the pro-level sound quality make this unit a real winner. There’s more in the full Roland Studio-Capture review. It’s an audio interface that’s packed with features, it delivers pro-grade sound performance, and it is red and black – it must be a model in Focusrite’s Clarett Series! The rack-mounted, Thunderbolt-enabled Clarett 8Pre is another high scorer in this chart thanks to its style, versatility, performance, and ability to handle serious studio work with ease. This attractive unit features eight analog inputs (all XLR/TRS combos), exceptional preamps, and solid performance with a depth of 24-bits, a 192kHz sample rate, and lightning-fast speeds. There’s more on this solid audio interface in the complete review of the Focusrite Clarett 8Pre. When you step into the higher-end of the market, PreSonus is a brand that will always give you a lot of bang for your buck. The PreSonus Studio 192 is a trusted audio interface, built for professionals and serious enthusiasts alike. The core of this package is its numerous I/O options, with up to 26 inputs and 32 outputs, with several excellent XMAX preamps and a Fat Channel DSP. As we highlight in the full review of the PreSonus Studio 192, it’s a USB 3.0 interface that yields near zero latency even under heavier loads. Overall, very solid. The UltraLite AVB is a new entry to this chart and another MOTU audio interface worth getting excited about! For starters it offers a total of 36 simultaneous I/O options (both analog and digital) with a very small footprint, which makes it endlessly flexible for bigger recording operations. 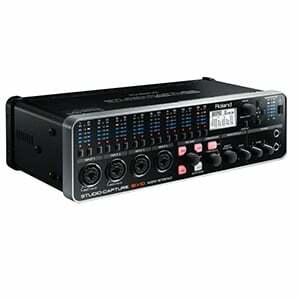 The onboard DSP mixer is also incredibly useful, with tons of features. The desktop unit itself is solid, compact and stylish, and works well with both Mac and Windows and a long list of DAWs. Be sure to read more on the MOTU UltraLite AVB in the full review. The name Steinberg is most associated with DAWs and other audio software, and – while they are one of the authorities in that area – the German brand are just as proficient in the high-end audio interface market. The Steinberg UR824 – which we have taken a closer look at here – proves this! This rack-mounted unit delivers a simple design, quality build and excellent hardware. It includes 24 inputs and 24 outputs divided into analog and digital clusters, as well as a set of awesome Yamaha D-Pre preamps. As expected, the software side of the deal is also extensive and very handy. An impressive package! Another entry from MOTU on this list is the award-winning 828x, which fits the traditional description of a solid, no-nonsense audio interface. This rack-mounted unit features a wide range of well-implemented tools and a superfast Thunderbolt connection. The I/O options are equally impressive, with 28 inputs and 30 outputs (both analog and digital), while controls and analytical features are more than ample. It also comes with onboard DSP and built-in effects. MOTU describe it as their best-selling audio interface – we can see why! Want more on this powerful unit? 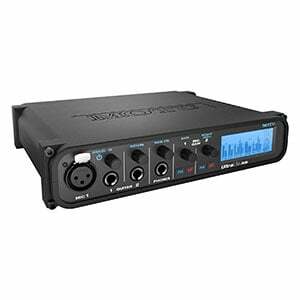 Check out our complete MOTU 828x review for all the details! With a deceptively simple design and small form factor – as well as limited I/O options – it’s easy to understand why someone might mistakenly believe the Apollo Twin MkII Duo to be a little overpriced. However, this desktop audio interface packs a very serious punch indeed! With a cool design and quality metal build, this Thunderbolt unit features an impressive set of preamps and converters, delivering exceptional sound quality – some of the best on this list. Plus, it looks pretty cool! Be sure to read the full breakdown of the Apollo Twin MkII Duo for everything you need to know! When you start investing such a hefty chunk of cash into recording gear, you aren’t solely looking at better sound quality. It sounds obvious, but there are several benefits of buying a higher-end unit over a budget or mid-range audio interface. Let’s take a closer look at each one of these benefits and at why they matter. Starting with connectivity, in this price range you will find USB 2.0, Firewire and Thunderbolt connections used to connect audio interfaces to your computer. Contrary to popular belief, USB 2.0 is still a very viable solution, even when you have up to 30 inputs in your interface. With that said, you will see many more Thunderbolt and Firewire-based units in this segment of the market. Both of these advanced connection solutions are created to work efficiently in a professional environment, and guarantee fast speeds, high bandwidth and a low latency for the most effective monitoring. For some, there is simply no incentive to pay more for a Thunderbolt model if they can get by with USB 2.0. Similarly, some producers and audio engineers may require the zero latency that Thunderbolt is known for, and will snub anything without it. What you go for will depend on what works best for your specific needs. Always remember that some computers don’t have Thunderbolt or Firewire ports – check yours before buying an interface with such a connection! Just one quick glance at our list reveals all kinds of designs, although they are still split between both desktop and rack-mounted units. 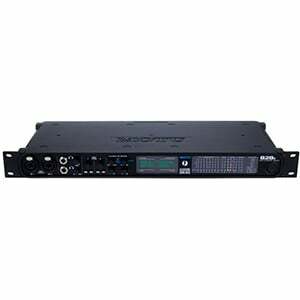 In this price range you do see a lot more rack-mounted devices compared to a lower-end category, such as the audio interfaces under $200. This isn’t necessarily a benefit to everybody, as many shopping in this range will still be happy with desktop units due to their low desk real-estate requirements and portability. However, if you have a bigger operation, you will already cram anything you can into a rack to save space, so having the option of more rack-mounted devices will be a plus. One of the main benefits reserved for $1,000 audio interfaces are hugely versatile I/O options. The most common layout for professional audio interfaces is to offer at least eight analog inputs and analog outputs (usually in the form of combo XLR/TRS inputs or dedicated 1/4” ports). The rest will come through ADAT ports, which allow you to expand the number of I/O options by at least ten. Digital channels may be a niche feature, but they are excellent solutions for bigger recording projects and busy studios – especially those recording full drum kits. You will see a variety of I/O combinations in this segment, some with up to 60 I/O options, with other offering around 10 to 20. As always, choosing the right one comes down to your own needs and preferences. Alongside inputs and outputs, built-in features are probably the next most important benefit of owning a high-end audio interface. Features can come in many forms. For example, some audio interfaces include onboard EQ tools and various effects, while some have very complex metering clusters or even analytical tools. It can seem tempting to go for an interface packed with features, although try to determine whether you will actually need them. If you don’t, chances are that you can get by with a much cheaper interface. However, if you are serious about your work and demand the highest level of both performance and versatility, some of these features are an essential factor. High-end audio interfaces are expensive, but they definitely have plenty to offer for the hefty price tags they come with. In all honestly, this type of gear transcends the experience you may have had with an affordable audio interface. Whether lightning-fast connections or more I/O options than you know what to do with, you have entered professional territory where great performance is guaranteed! The models we have highlighted in our chart are by far some of the best on the market in 2018. Whether you go for one of these or explore the market by yourself, we hope this article has been of use and offered a little inspiration. Good luck with your new interface! Where is tye spl crimson3?